Day 2: Let The Real Eating Begin! Check out the now completed entry from day 1 of my trip! I've just posted pictures from day 2 which includes visiting Mercat de la Boqueria, Dulcinea, La Sagrada Familia, Oriol Balaguer, Cacao Sampaka, and Abac. I'll update this entry as soon as I have time to write something about it. It's gonna be El Bulli tomorrow! I can't wait. Well, actually, not really. I am not really that tired considering I went through a whole week of interval training and regatta. However, trying to eat well in a strange city after going through 13 hours of traveling (flight and waiting time included) can be a little tough. As luck would have it, our first day in Barcelona is a holiday and many restaurants and stores are closed today. We had a meal of mediocre tapas at a tourist trap stone throw away from the hotel. After that, my eating karma definitey kicked up and I had some delicious horchata, beautiful Catalonia pastries from Bubo, delicious gelato from Cremeria Toscano, and a much more satisfying tapas dinner at Taller de Tapas. Check out my pictorial from today's eating! Carles Mampel's Catalonia-influenced pastries at Bubo was one of my highlights of the day. Their selection of petit fours is so precious, for lack of a better word. The style of this pastry shop is along the same line as the designer patisseries in Paris (think Pierre Herme) although I would say the level of creativity is not quite up there. 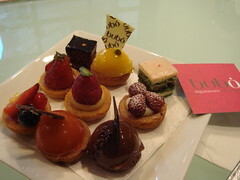 Most of the petit fours are made with a financier base. I personally found the guava gelee dome and the mango gelee dome to be the most delicious because the flavour of the fruit really came through. The mango, especially, tasted as if the gelee was made from fresh fruit instead of premade puree. 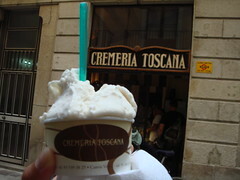 Next door to Bubo, there's a branch of Cremeria Toscana for gelato. There are practically gelaterias around every blocks, however, as one of the oldest gelaterias in the city, Cremeria Toscana definitely had an edge. I tasted their Plantana con Fruitaso (sp?) flavour. Instead of the taste of overripe bananas, this flavour highlighted the fresh fruity taste of a green-tip banana. The texture of this gelato was also very smooth and creamy. I was a happy girl. We enjoyed two very different tapas experience in the same day. When we went out for lunch, we were oh-so-tired from a long flight from Toronto to Barcelona via Frankfurt. After checking in to the hotel, we pretty much hopped into the first decent-looking restaurant, El Choquito, outside of the hotel (Hotel 1898 right smack on La Rambla). Well, we knew we were in for a tourist trap experience but when hunger striked, anything would do. We ordered a set menu of tapas and a paella. Let's just say it was a very overpriced meal for very medicore food (really soggy pan con tomate anyone?). For dinner, we fared much better at Taller de Tapas though how we ended up there was a long journey too. As today is a holiday, many of the stores and restaurants are closed. Thus, looking for a good restaurant that's open is a challenge to say the least. Our original plan was to visit Mesa David for roasted baby lamb upon the recommendation of a friend. Unfortunately, we only discovered that it's closed for the day when we were at the door. Tracing our steps back the opposite direction, we found Taller de Tapas after a few misteps (I'm the the greatest navigator/map reader in the world). 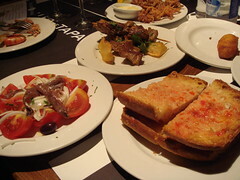 The food was much more delicious and I would rather claim that it is my first tapas experience. Ahem, I think we should just forget the fact that I ate at El Choquito at all.